K. Anders Ericsson is a Swedish psychologist who is a professor at Florida State University. In the beginning of his career he worked with among other Nobel laureate Herbert Simon. He is recognized as the most prominent researcher in the area of expertise development. Together with his colleagues, he has done research into how experts in different areas have managed to reach the top of their fields. Uptil now he has mostly scientific publications. 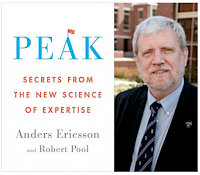 But now he and Robert Pool have published a popular book about expertise development: Secrets from the New Science of Expertise. Here is an interview with Ericsson about this new book. Q: What inspired you to write PEAK? For the last thirty years I have searched for what makes experts different from the rest of us. I have studied chess masters, elite musicians, and outstanding athletes as well as experts in such professional areas as medicine, education, and business. The most interesting finding is that, no matter which area you look at, you find that the achievements of these remarkable individuals are the result of years and often decades of daily efforts to improve. The differences in ability between them and less accomplished individuals in the same area are not due to some innate advantage or gift; instead, the experts developed their abilities through an orderly sequence of gradual changes in their muscles and brains which allowed them to improve their physical movements and the quality of their thinking and perception. In this book Robert Pool and I describe how I first discovered the remarkable improvements in memory for strings of digits—by over 1,000 percent—that are possible for average adults with the right type of practice; later I found that similar types of practice can improve virtually any mental or physical aspect required for expert performance, with the exception of height and body size. Over the years numerous people have told me that these findings have allowed them to find the methods to reach higher levels of performance than they ever thought possible. This book is written to share this information with everyone who wants to improve their own performance in some activity or who wants to help their children and other people improve. Q: What is “deliberate practice” and how it is used to develop expert performance? Q: Can you give some examples of how “deliberate practice” differs from the typical types of practice and experience and explain why it improves performance so much more? When people play tennis with friends they will occasionally make mistakes. For example, you may miss a backhand volley during a doubles game. The game continues, and an hour later you miss another backhand volley. Under these conditions you are not likely become any better even if you keep playing on a weekly basis for years. Compare this situation with one where you contact a tennis coach for a lesson! The coach can allow you to stand by the net and prepare for an easy volley to be returned with your backhand. The coach can help you make corrections and deliver particular types of volleys to hit until you do so well. As you improve, your coach can give you harder balls and eventually intersperse backhand volleys during rallies. This is an example of deliberate practice, and the improvements on the backhand volley resulting from a few such hours with a coach will be greater than would occur with years of playing recreational tennis. In the book we discuss similar issues that face professionals. For example, when doctors listens to patients’ heart sounds, they will not know for days or weeks—if ever—if they missed a heart problem. It’s hard to get better without some sort of feedback telling you whether you got something right and, if not, how you went wrong. In this particular example, doctors could engage in deliberate practice by listening to recordings of heart sounds of patients whose final diagnoses were known. With access to a library of such recordings, a doctor could make diagnoses and get immediate accurate feedback on each decision. And with a coach monitoring this testing, the doctor could get training on the particular types of heart problems that he or she had difficulties with and encounter more such cases in one afternoon than in years of regular medical practice. We offer examples of this type of deliberate practice for many types of professional activities in our book. Q: Why do you say that the popularized 10,000-hour rule is actually wrong in many ways? In his book Outliers Malcolm Gladwell cited our research in support of his “10,000-hour” rule that at least 10,000 hours of practice (Gladwell actually never used the term “deliberate practice”) is required to become highly successful or an expert. His famous ”10,000-hour” rule captures well our findings that developing expert-level performance in an internationally competitive field such as classical music, ballet, or chess requires a surprisingly large number of hours of practice, even for those with greatest amount of natural talent. However, our research shows that there is nothing magical about the number 10,000. To win an international piano competition you need over 20,000 hours, while our trained memory experts were able to become the best in the world in 1970s with less than 1,000 hours of practice. My greatest concern about the “10,000-hour rule” is that it has caused many people to think that they need to accumulate 10,000 hours of experience—as opposed to deliberate practice—in order to attain expert performance. Our reviews shows that simply accumulating a large amount of professional experience does little to improve one’s performance. We argue instead that you need to engage in practice that meets most of the criteria for deliberate practice if you wish to attain superior performance. In Outliers Gladwell offered the story of the Beatles’ intense playing in Hamburg as an example of the 10,000-hour rule in action, but in reality their thousands of hours playing music in front of audiences had few of the characteristics of deliberate practice. And this is the greatest flaw in the 10,000-hour rule as it is usually understood—that it assumes that any sort of experience will lead to improvement and that 10,000 hours of experience will make you an expert. No. If you are not following the principles of deliberate practice, you have no guarantee that those many hours of “practice” will help you improve at all. Q: What part does innate or physical ability play in expert development? What if we aren’t born with so-called “extraordinary abilities”? Except for identical twins, each person is born with a unique set of genes. Assuming that this in turn implies that we are each born with a unique set of capabilities, many people set out to determine what their innate talents are by trying out a lot of different activities and possible professions and seeing what they are “naturally” good at. The concept of being born with “extraordinary abilities” is one piece of this overall view of human nature; the idea is that a lucky few have innate capabilities that are far beyond what most people possess. However, what we show in the book is that when people do have “extraordinary abilities,” these abilities do not simply magically appear at some point in that person’s life. Instead, a careful analysis of the development of such extraordinary individuals shows that their abilities were acquired gradually, even when the abilities were first demonstrated in childhood. For example, we show how Mozart’s prodigious achievements were the results of his unique training environment. As recent research has shown, the vast majority of genes in the DNA are dormant, and engaging in focused mental and physical activity changes the chemical environment of cells, leading the cells to activate genes which in turn cause changes at the cellular level. In the book we discuss how intense extended physical training can change the size of hearts and muscles and arteries and even change the nervous system and the brain. Some types of changes are only possible during certain phases of childhood, while the body is maturing; examples include changes in the body’s joints related to turn-out for ballet dancers and the overarm throwing motion for baseball pitchers. At this point the only physical characteristics we know of that are predictive of expert performance and that cannot be modified by training are height and body size. The conclusion is clear. To excel in any area you need to engage in relevant activities and, ideally, in purposeful training in order to attain the physiological adaptations and to build the thinking skills that you need. If you just wait around for your innate talents to spontaneously appear, you are likely to be waiting for a very long time. Q: What can the average person do every day to get better at a desired skill? No matter what area you’re looking to improve your performance in—singing, playing a musical instrument, playing a sport, cooking, or something else—your first step should be to find a good teacher who will help you design a personal plan for improvement. Your teacher should assign specific training activities designed to build various skills, but there are a number of things you can do to improve the effectiveness of your training. One of the most important is that you should start out with short daily training periods where you maintain full concentration for 15 to 30 minutes. You should also schedule your training for when you are completely focused. Ideally this will be in the morning when you have woken up by yourself and you feel most refreshed—starting the day with a work session is the habit of many famous authors, scientists, and musicians. It is important to monitor your concentration and to stop when your ability to concentrate begins to wane. The worst thing that you can do is push yourself to practice beyond the time that you can concentrate effectively. Also, as in any long-term commitment, you will need to nurture your motivation. One of the best ways to motivate yourself is to pay attention to the progress that you are making and enjoy it. There are few things that feel better than challenging yourself to get better on a task and then reaching a level of performance that is beyond anything you had previously been capable of. Q: How can we use deliberate practice to improve our performance at work? When you measure the performance of health professionals, teachers, and counselors objectively, you find that their performance rarely improves much after their first two years of professional experience. That is, they rarely get better with practice. And the reason, as we discuss in the book, is clear: They are not getting the sort of practice or training that leads to improvement. One of the main problems is that when people work at these jobs, they rarely get accurate immediate feedback about their performance. For example, when a medical doctor diagnoses and treats a patient, getting feedback about whether the diagnosis was correct may require months of testing and treatments. Furthermore, professionals are often unprepared to deal with an emergency situation where they have to make a quick decision because they have not received the training necessary to quickly recognize the emergency and determine the appropriate response. In this book we describe how professionals can be trained with simulations or with descriptions of previously treated patients and past emergency situations where the best courses of actions have already been determined. In such training, professionals can react to these prepared cases and get immediate feedback about whether they responded correctly and, if not, what they should have done; this gives them the chance to reflect on how they need to change their thinking and actions in order to perform better when they encounter the same situation in real life. In the most effective of these training practices, a teacher will monitor the professionals’ thinking in order to pinpoint any particular weaknesses; once a weakness has been identified, the professional can then be given a series of cases designed to help correct that particular weakness. I believe that getting professionals engaged in this type of training will help them get greater personal satisfaction from their jobs because they will be engaged in a journey of continued learning. Q: What can our school systems learn from the lessons in PEAK? There are a number of ways in which the training of expert performers differs from the typical approach to education in our schools. For example, training activities in music, sports, dance, and the professions are focused on helping individuals build skills rather than on simply accumulating knowledge, which is goal of most of the education in our schools. Deliberate practice is focused on doing rather than on knowing. In particular, deliberate practice helps build effective mental representations, which are crucial in analyzing a situation, deciding what you are going to do, and then monitoring your actions. It is these mental representations that allow skilled musicians to imagine what a piece of music will sound like, listen to themselves practicing to identify aspects that can be improved by practice, and even listen to themselves playing favorite pieces and enjoying that experience. Mental representations are also behind the ability of expert doctors and scientists to analyze complicated problems and come up with accurate explanations and predictions. We believe that one way that education could be improved would be for educational specialists to study the mental representations of various expert performers—scientists, writers, and so on—and come up with training activities that will help student begin developing the types of mental representations that will be useful to them as adults. There are signs that the education system is starting to move in this direction. For example, students are being given more opportunities to engage in active thinking to develop their reasoning about and handling of real-world situations. By providing students with individualized activities with immediate feedback, teachers can help students acquire mental representations that support their planning, thinking, and reasoning about phenomena in the social and natural sciences. In particular, we recommend that educators start thinking about education more in terms of slowly building adult skills. For example, we know that children who read books for their enjoyment can be encouraged to read more adult-like books and thereby improve their vocabulary and ability to comprehend complex materials. In our book we discuss efforts to change the focus of science education from the memorization of facts and the solving of basic problems with multiple-choice answers to an emphasis on training students to think and reason about scientific phenomena, ideally by conducting experiments in everyday life or laboratories. In this way, students start to develop the mental representations necessary to think effectively about scientific topics. Finally, we believe that schools should develop practice activities aimed at helping students acquire a level of independent mastery of such skills as computer programming and to give them a foundation from which they can keep improving these skills throughout their lives. Q: What do you hope readers will take away from this book? The most important message of our book is that people can improve their performance in virtually any activity with the right sort of practice. It’s not easy—there are no magical shortcuts by which you can get better virtually overnight. It takes sustained, focused training—preferably under the direction of a teacher or coach—to elevate your performance to a higher level. But the good news is that just about anyone with normal mental abilities can do it. You don’t need exceptional memory or intelligence or perceptual abilities to become an expert performer. Instead, the evidence suggests that while such superior general abilities may provide an advantage to people who are in the early stages of developing a skill, that advantage disappears over time, and the most important factor in developing advanced skills is not innate abilities but rather the amount of deliberate practice that one has engaged in. One result of this is that expert performance is very specialized to a particular domain and does not generalize to other domains. All the book can do is to give readers information about the path they must travel to improve their capabilities in their chosen field and perhaps even reach the peak of that field. It is up to the individual reader to decide whether he or she will follow the path. I should note, however, that there are many benefits of following that path over and beyond the development of an extraordinary skill. In my experience expert performers are very interesting and reflective people who have a goal that keeps them directed toward improving and keeps them engaged in their lives in such a way that makes their daily lives meaningful. Their goals and their striving to reach beyond their current performance can be seen as an exciting journey that is constantly exposing them to new experiences.